Aw, love this. They'll love you! And such a perfect job for you. Best of luck with the rest of the year! Moving and change is always daunting. I can so relate! I like your perspective on this. I am in two buildings every day. p.s. I would totally play with you at recess! lol. Wow, that's a logistical nightmare, moving every 3 weeks. I am glad you were able to get settled in and find your way around. I appreciate how you empathized with the "new kids" through your experience. Not an easy thing at all. Yes, we have first day jitters, too! 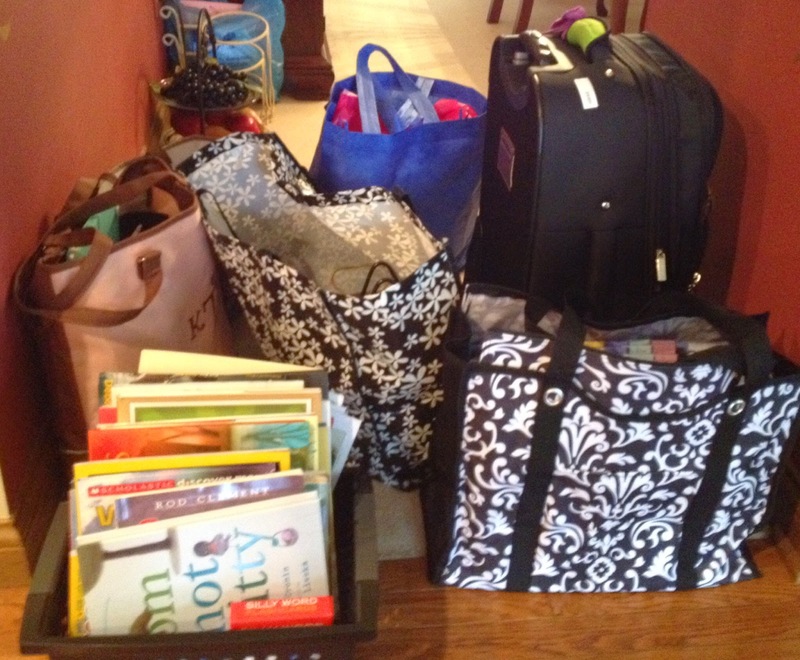 I am impressed by the number of bags you travel with - wow! I'm glad you published this slice NOW, Karen. It gives us a look into what your life is like. I can't imagine having to resettle myself constantly. When I go into schools it's for a day. It's different as a consultant. As someone who appears, disappears, and reappears, I think your job sounds much tougher. Such a challenge! It keeps things interesting, though, I bet! When I first started my job at Kings as a gifted teacher, I taught 4th grade and needed to serve all the gifted reading kids, but the district has 4th graders in 3 buildings! I drove to each building every day. It was quite interesting to make sure I had things I needed every day. I actually kind of liked getting out and driving, though. ;-) Now I'm in one place, and I do have to say it's nice to have my own space in ONE place. I bet you're so wonderful as a coach!!! Love how you saved this and published it now --great to share with students. We never know when our writing will find an audience! Love the reflection you added. This first year will be the most difficult since you have to establish yourself each time. However, next year they will be welcoming you with open arms because they know what a great resource you are. But I would sure hate all that moving. I know you would have no problems finding someone to play with at recess! I think writers capture lots of ideas and thinking but don't always share them publicly until they are ready. Have a great second cycle in your new position. That moving looks a bit daunting. I'm sure you will perfect it before the year is over. I know being in a new position sure has me thinking and rethinking the things I do each day. I was so happy to see your name in the slice posts for today.